Fall in love with cutting circles again using this unique and precise Magnetic Circle Cutter from We R Memory Keepers. The Magnetic Circle cuts 4" to 12" circles with ease. Use the Magnetic Cutting Mat and fall in love with cutting circles again! 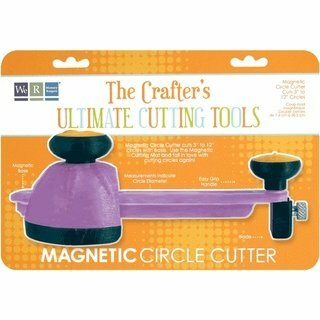 How Do You Rate Your Crafter's Magnetic Circle Cutter? Let us know what you think of We R Memory Keepers - Crafter's Magnetic Circle Cutter. Your story will appear on a Web page exactly the way you enter it here. You can wrap a word in square brackets to make it appear bold. For example [my review] would show as my review on the Web page containing your review.